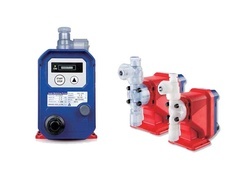 The EJ Series provide precise chemical injection at an economical price. Universal voltage capability enables operation from 100 - 240 VAC in virtually all countries. The EJ Series are compact, simple to operate and have outputs to 1.3 GPH (4.8 LPH) and a maximum pressure of 175 PSI (1.2 MPa). The EJ Series operate at 360 strokes-per-minute, providing high resolution chemical feed and high turndown capability. Most competitive products operate at slower speeds, resulting in slug feeding, accelerated diaphragm wear and poor feed control.